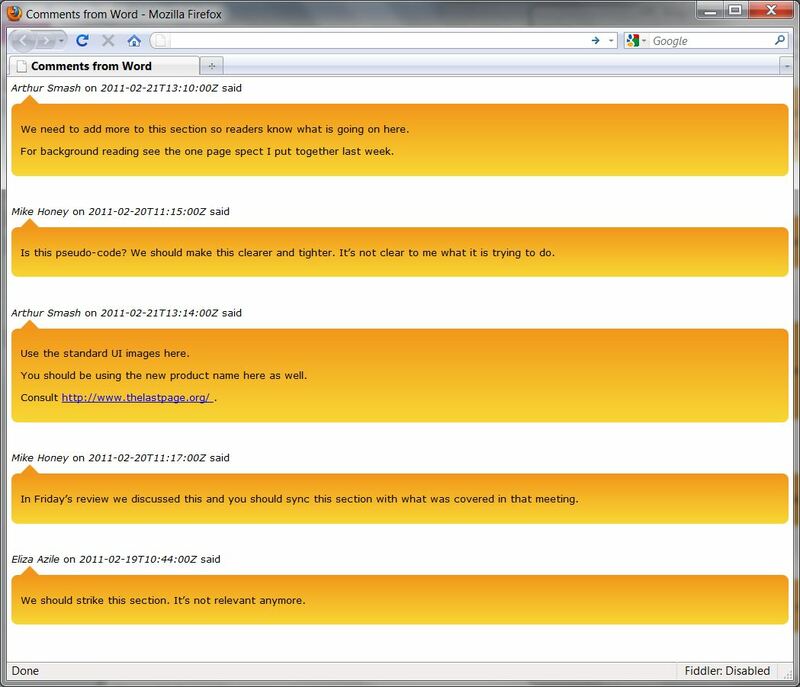 This post shows one way to grab all the comments from a Microsoft Word 2007/2010 document and display them as HTML. 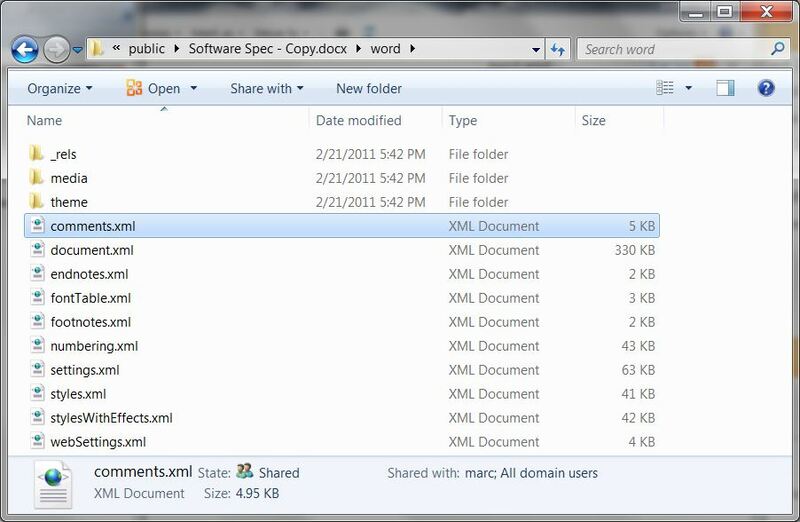 The method shown here leverages the fact that, starting with Word 2007, documents are zipped packages of XML files and associated resources that can be "cracked" open simply by changing the extension from .docx to .zip. This capability is part of the Office Open XML standard, ECMA-376. 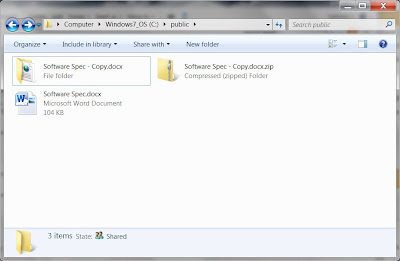 In other words, a Word document is really a ZIP package that inside contains a virtual directory structure with XML files and resources (like images) that comprise the document. 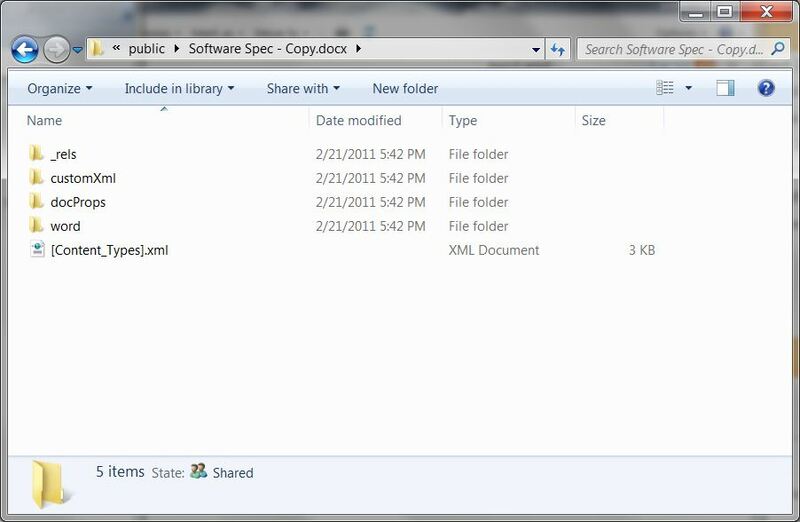 The package concept as described on MSDN is analogous to a filing cabinet. There is a good tutorial on the open format on this Office training page. The ZIP-like behavior applies to more than just the Word format we are dealing with here. 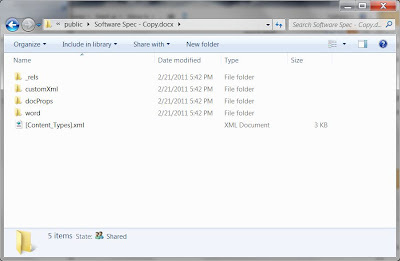 It applies to Excel spreadsheets (.xlsx), PowerPoint presentations (.pptx) and XPS documents (.xps). We thought this was kind of interesting when we first learned about it and thought about a way to exploit this format. What we came up with a scenario when you want to get the comments out of a document. With that in mind, let's begin. 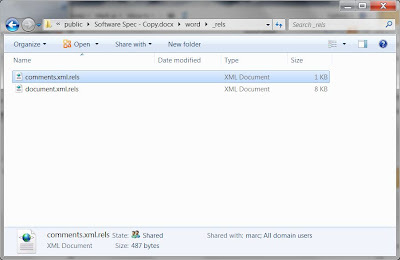 In the _rels folder there is a comments.xml.rels file that contains the hyperlinks that are used in the comments. 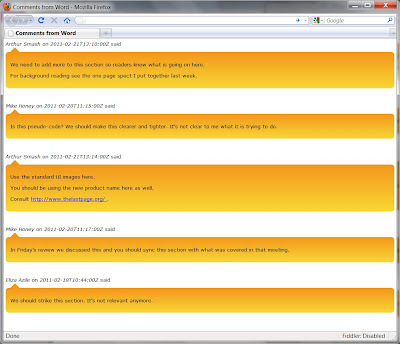 Together the comments.xml and the comments.xml.rels can be used to get what we want. 1. Take the comments.xml as is and place in a directory (we'll call it the transform directory) where we'll do the transformation. 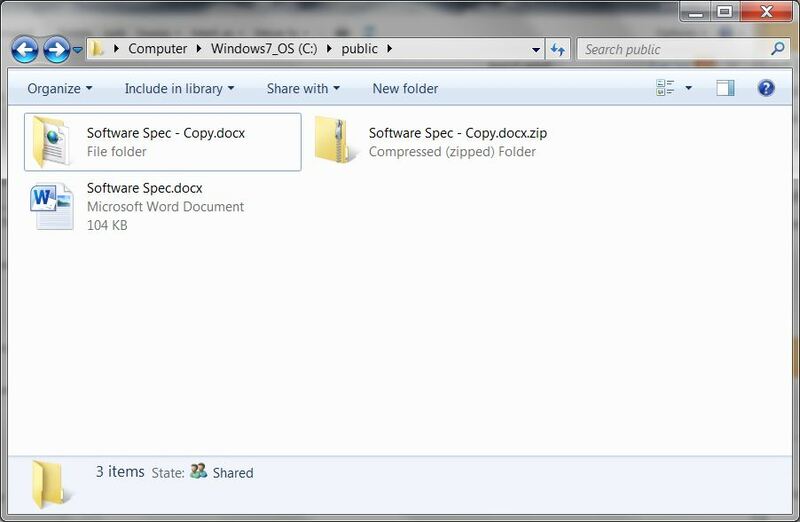 A different place than the unzipped folder is best to start with. 2. In the transform directory put the comments.xml.rels file. 3. In the transform directory create a transform.xslt file and put the content shown below in it. 5. Finally, in the comments.xml file, add the line that references the transform.xslt file. Above we specified that we were dealing with comments and hyperlinks in the comments. 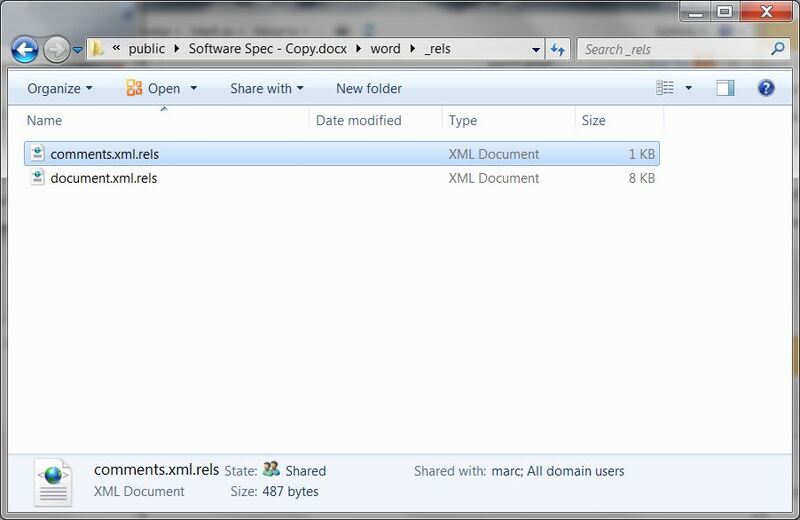 But, more generally, comments in a Word file can have images, SmartArt and a lot more. 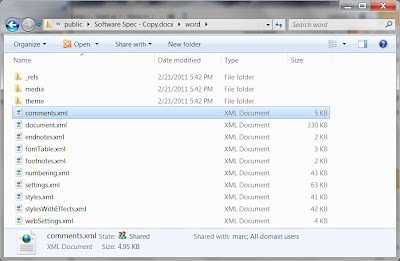 To make the comment extraction method given here more robust you would need to modify the XSLT to take all this into account. For example, if you inserted a SmartArt Graphic into a comment, the word\comments.xml file would reference a relationship in the word\_rels\comments.xml.rels file which would reference word\diagrams\data1.xml (for example) that might in turn reference another file \word\diagrams\drawing1.xml (for example). The point is, it can get quite complicated and all the paths need to be followed to reconstruct the comments as they appear in the document. A subsequent post describes a C++ program to get comments.